Earlier this year, I visited New York City to film a video with Universal Standard to introduce their petites collection. While in New York, I stopped by Christian Siriano's boutique The Curated NYC which opened that same week. The Curated NYC naturally carries Siriano's fashion but it also carries other brands including Universal Standard. I know Universal Standard quite well, but seeing the clothes hanging in this boutique gave it a different feel. And when I saw this Universal Standard trench coat I fell in love. It was hard deciding which color to get in this coat, but I went with Oyster because I felt it would work with warm as well as cool colored accessories and not be so dark feeling in the spring, but gosh the Camo color is also pretty fantastic. 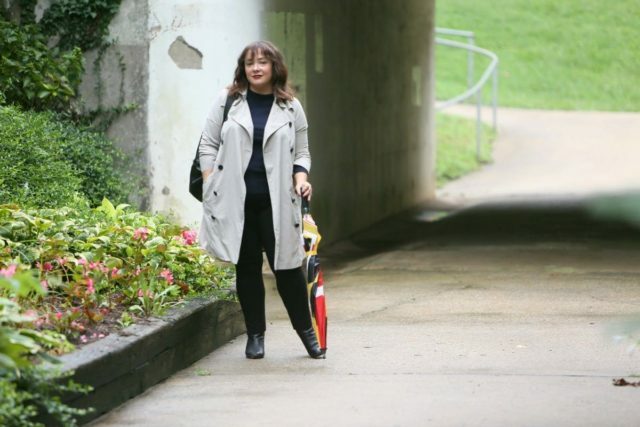 The Universal Standard trench coat doesn't come in petite so the sleeves are a bit long, but there's no buttons or closures on the sleeves so they're easy to hem. The silhouette is straight and while there's tabs in back to add a bit of shape, in general it's a straight silhouette that works well with bukly sweaters and jeans as well as sleek cocktail dresses. This outfit is pretty simple, but simple can be chic. Talbots is one of my favorite places to buy cashmere. The weight and quality is excellent, the silhouettes classic but stylish, and their color selection is fantastic. Navy is a great neutral as it looks great with denim, olive, gray, ivory but also black. 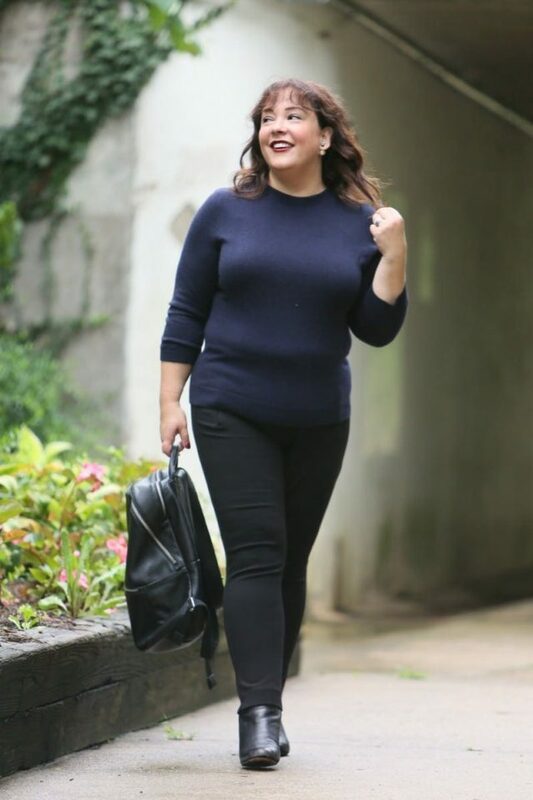 Yes, you CAN wear black with navy and the result is quite chic! These pants… expect to see a lot of them. They are the So Slimming Juliet Ankle Pants from Chico's and they're pretty fantastic. They're made from a heavyweight ponte knit and have a panel in front to smooth the belly. I literally wore them three days in a row and they didn't get baggy and looked polished while being as comfy as sweats. 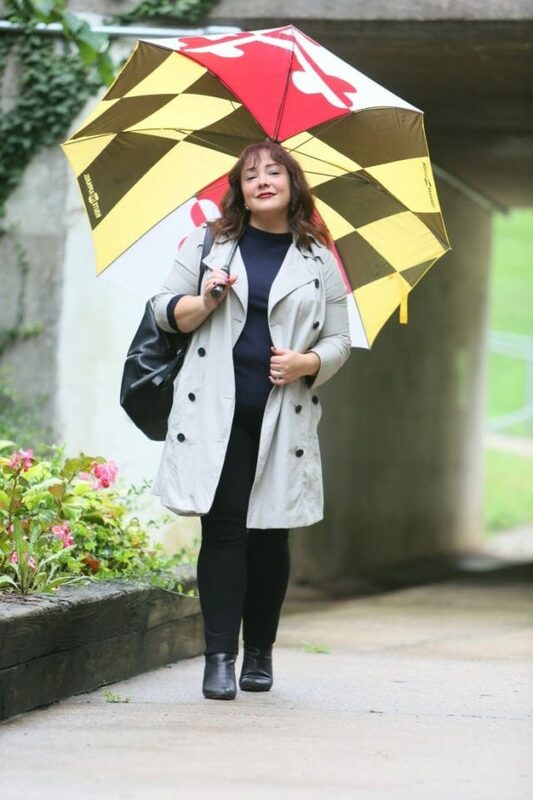 And as for the umbrella… while I was born in Washington DC I have lived in the great state of Maryland for most of my life (even went to college in Maryland – go Terps!). I don't know about other states, but those in Maryland love the flag. Crab-shaped flag stickers on our cars, flag-printed tire covers on the back of Jeeps, flag-printed lanyards for our work IDs, I could go on and on. 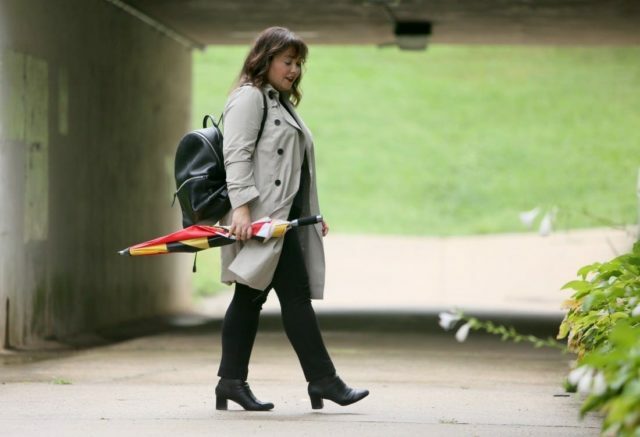 I have Maryland flag bandanas (see in this outfit post) and this is by far my favorite umbrella. A bit of state pride along with some cheeriness on a dreary rainy day, hon! Route One Apparel is one of my favorite places to get Maryland-themed clothing and gear. You look prettier every day. I think the freelance life agrees with you. This outfit looks perfect for this time of year and this transitional weather is tough to dress stylishly for. 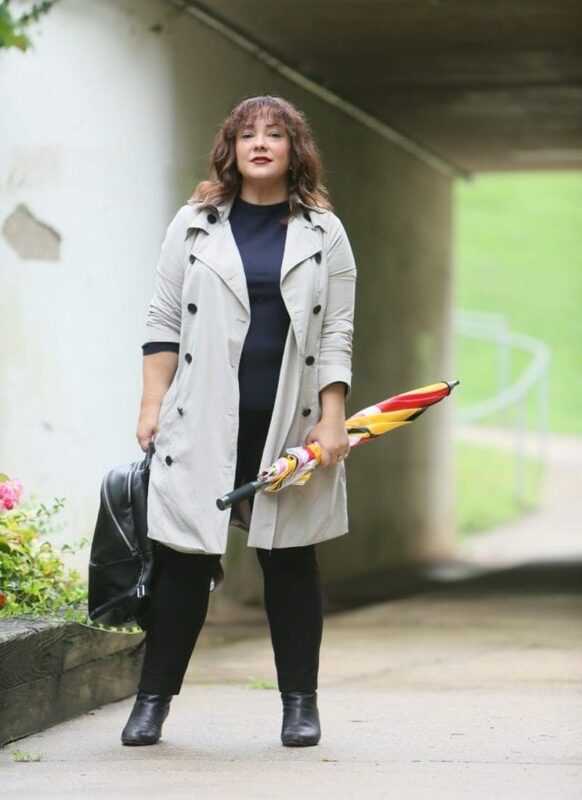 I love that flag umbrella. I noticed it right away. As a graduate of a Big Ten school, this Nebraskan says Welcome Maryland. The trench is a great cut for you. I love “short person tax” (re: needing a tailor if you are petite) from the commercial! How does the trench coat look buttoned? I am wondering about the double breasted aspect. Also, I have been enjoying the petite US line, but find it frustrating that new things come out every week on the regular sized line, but the petite line stays stagnant. Nothing new since it was released! It looks okay buttoned but it looks very utilitarian, no belt to cinch it. But I do wear it buttoned when it’s very rainy or windy. It doesn’t pull anywhere, a nice fit. I too wish they’d come out with more petites! Enjoyed this – you’re always pulled together! Okay am I a loser for not knowing what Universal Standard is? Either way, I feel less like one now! 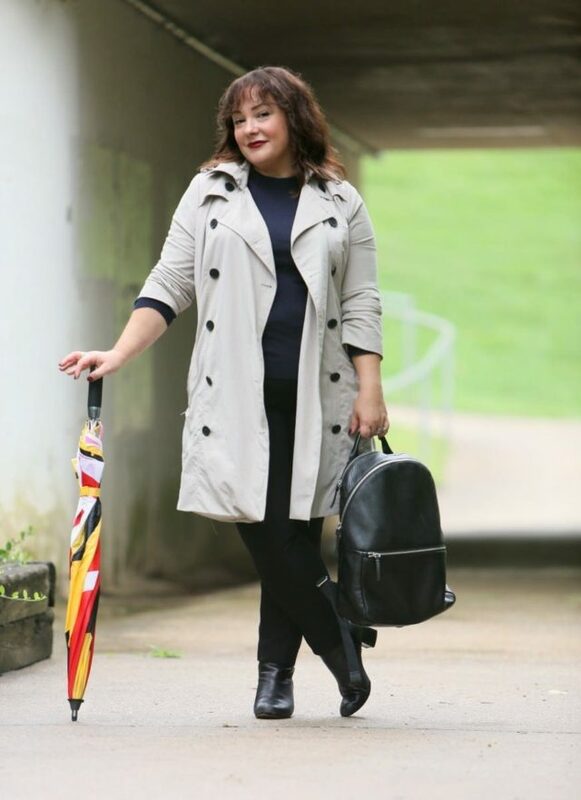 Do you have any tips on knowing when a trench is right for you? I ask because I am always afraid they are going to be too boxy on me! I look for a softer fabric. Stiff twills will make you look boxy. If double breasted, instead of an a-line look for a fit and flare style, which can be from cinching in back or a belt. Also look for petite if you’re in any way petite because it won’t be so boxy in the shoulders and skim your curves better!